Dr. Yanta and audiologist and Alicia Bernstein have extensive experience in evaluating and treating infants and children of all ages. Dr. Yanta has been on staff at Children’s Healthcare of Atlanta (Scottish Rite and Egleston’s Hospitals) for over 15 years. Our office is equipped to perform hearing testing on newborn infants (Otoacoustic Emissions Testing) as well as children of all ages. 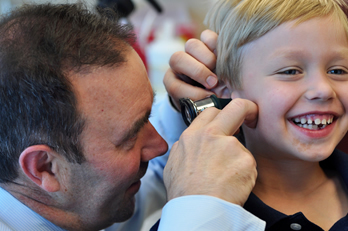 We are committed to early diagnosis of hearing loss, and are able to provide appropriate medical as well as surgical treatment of hearing loss if needed. Nasal congestion. Starting around the age of 2 years, children often begin to suffer from nasal congestion related to repeated colds, food or airborne allergies, and growth of adenoid tissues. Our office has pediatric-sized equipment which is designed to allow Dr. Yanta to more comfortably diagnose the cause of nasal obstruction in children of all ages. If x-rays or allergy testing is needed, Dr. Yanta is affiliated with facilities and physicians who can fulfill these needs. Recurrent Ear Infections - Ear Tube Placement (Tympanostomy). This is a procedure in which a very small opening is made in the eardrum and a small tube is placed in order to drain fluid from the middle ear space. This can be done in order to improve hearing or to relieve pressure in the ear from Eustachian Tube dysfunction. In adults with favorably-shaped ear canals, this can frequently be done in the office, with no need for a general anesthetic. Ear Drum Repair (Tympanoplasty). This is a procedure in which a hole in the eardrum is repaired. Repairing a hole in the eardrum will frequently improve hearing, and will reduce the risk of an ear infection should water get into the ear canal. Tonsillectomy and Adenoidectomy. Tonsils and adenoids are really just lymph nodes, responsible for fighting infection, which reside within the nasal and oral cavities. Adenoids are situated at the very back of the nose, where it connects to the air space behind the palate - the nasopharynx. Although the tonsils and adenoids are there to help fight off infections, there are times when they can themselves become a part of the problem either because they are harboring bacteria and serving as the "source" of infection or because they are enlarged and are causing blockage of nasal airflow, sinus drainage, or ear clearing. When medical therapy has failed to improve symptoms, a tonsillectomy and/or adenoidectomy may be indicated. In many children, repeated infections or allergies or acid reflux disease can cause enlargement of the tonsils. Because of its proven efficacy and safety, Dr. Yanta elects to remove tonsils using Coblation rather than older, more painful methods.